The UK’s first Halal online food ordering platform, with verified halal restaurants and 2016 MassChallenge UK finalist has been exclusively appointed as the Sales & Marketing partner of a new retail certification scheme “Traditional Halal” under the supervision of the UK’s largest pioneer Halal certification body, Halal Food Authority (HFA). The new partnership will further allow HalalEat to attract more certified outlets on it’s platform and give it’s customers a gr eater peace of mind when it comes to choosing Certified Halal takeaway food online. At present HalalEat recognizes three retail certification authorities; HMC, HFA & Traditional Halal and welcomes eateries certified by either of these organizations in addition to eateries who can validate their claim to serving halal in the absence of a formal certification. 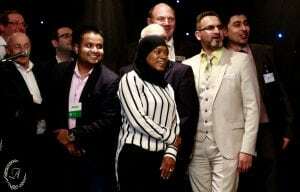 The official signing ceremony of the appointment was held at the HalalEat’s Partner Event on the 1st November in London. The event was jointly held under the banner of Salaam Events, a new sister company of HalalEat and it’s first foray into a business beyond food and technology. Salaam Events is focused on organizing events to help and promote businesses that are pioneering and promoting the growth of the Halal Economy. The HalalEat partner event is designed to support its restaurant partners to improve general standards, efficiency, productivity and be compliant in legal matters when it comes to operating a business in the food sector. The first partner event covered topical issues ranging from tax, procurement and Halal certification. HalalEat and Salaam Events Co is 100% private company that continues to be self funded and is controlled by its Founder & CEO Abul Rob. « UK: Spotlight on Halal lamb!